Metal maniacs, rejoice! 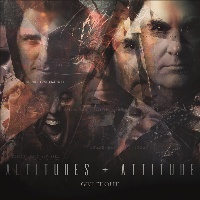 I am proud to present to you: ALTITUDES AND ATTITUDE; signed via Megaforce Records, hailing from the United States of America - performing Hard Rock, on their debut album entitled: “Get It Out” (released January 18th, 2019). Since formation in 2010; the band in question have their self-titled debut EP, and this here debut album entitled: “Get It Out”. 13 tracks ranging at around 45:83; ALTITUDES AND ATTITUDE arrange an intricately designed formula of Hard Rock developments, the titular track begins the record – conveying in boistrously bouncy flamboyancy and amplified adrenaline with an aesthetic of enjoyably composed instrumentation. The virtuosic duo who formed the band started out on tour with ANTHRAX & MEGADETH members Frank Bello & David Ellefson, conversing their ideas for this here creation. Ever wondered what Frank sounds like on vocals? Well, they are clean with a hint of rough juxtapostions - persistently pumping pipes of profusely robust singing specialities. Surprisingly strong! Consisting of a multiple magnitude of members; notably ANTHRAX and MEGADETH performers, Frank Bello (on vocals, Electric Rhythm Guitars & Solos) & David Ellefson (on Bass & Electric Rhythm Guitars) perform on their signature instruments as well as a diversely dynamic variety of versatile ultilizations. “Late” executes excelling complexity of dexterously diligent demonstrations of energetically chaotic mayhem, generating chugging leaps of galloping craftsmanship. Distributing crunchy consistency, constructively distinguished rhythms and relentlessly rampaging stampedes of rambunctious vehemence. Christian Martucci (from STONE SOUR) on lead & melodic guitars manifests meticulous thunder in “Out Here”; contrasting blistering captivations, amalgamating atmospheric and harmonious heaviness. Jeff Freidl (A PERFECT CIRCLE) on the battering drums; hammers his steel with pummelling haste, “Part Of Me” establishes efficient catchiness of skilful songwriting substance. Organically producing memorable originality, infectiously inventive injections of fluidly fabricated grit. Ace Frehley (KISS) on the Electrical Lead Guitars experiments with enlightening fulfillments of riffs and solos, salubriously showcasing rapidly swift nimbleness and riveting results. “Slip” embellishes on groovy haste; fuelled with firepower, expertise and seamlessly sonic speediness. Miki Black on backing harmonies & additional vocals vastly vocalizes harmonious heaven, as “Talk To Me” continues the collective culminations of light-hearted rock ‘n’ roll and indie-fused hymns - hardened with finesse and enjoyably entertaining orchestrations. Both Jon Danais (on lead guitar) & Nita Strauss (ALICE COOPER) balance gripping guitar solos in the persistently prodegious “Leviathan” (an eccentric belter) & the epic “Cold”, supplying vehement velocity mixed with progressively technical solidity. Implementing effective elements like a Hammond Organ from Randy Walker, pianist stability from Athena Ellefson & Russ Parish (STEEL PANTHER’s Satchel) on the Nylon String, contributing more uniquely unprecedeted weight. “Another Day” showcases primitive meatiness; relentless ramifications while providing proficiently easy-listening remedies of Hard Rock flair, shining on with thumpy stomps of stunning significance. If you were hoping for insane shenanigans in similar vein to that of ANTHRAX & MEGADETH; move on, it is there - just not that maddening - still worth examining in support of these legendary artists though. Gus G (OZZY OSBOURNE/FIREWIND) also delivers a concrete solo section, “All There Is” subjugates submerged soundscapes that passionately solidify quirky downbeats in which adroitly attribute an arsenal of licks that are elegantly exquisite. Also featured is the 3 songs from the first EP as well as a nice bonus including: “Booze And Cigarettes”, “Tell The World” & the overall concluding track “Here Again” all bring coherent aspects of old-school & new-school hard rocking relishments. Bottom line; the borderline foundation here is full of an engaging silver lining experience, it is quite refreshing to hear thrash titans join together to collaborate an almighty supergroup of this proportion – ALTITUDES AND ATTITIDE certainly outdone themselves here, and will most definitely apease to fans of both sub-genres if looking for a new discorvery.